Loudoun County government’s Multicultural Advisory Committee is again hosting community discussions designed to explore racial biases. The program includes a performance of an off-Broadway play with a challenging perspective, facilitated small group discussions, and a brief presentation on unconscious bias with tips and action steps. 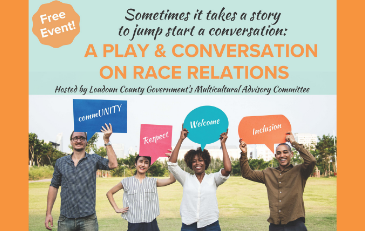 “The community conversations on race relations that the Multicultural Advisory Committee hosted in February were very well received, and it was clear to us that many people in Loudoun would like to continue to explore action steps to increase awareness and improve cultural communication in the county,” stated Assistant County Administrator Valmarie Turner. Because of the content of the play, the event is open only to people 13 years of age and older. Seating is limited. Pre-registration is required to attend. 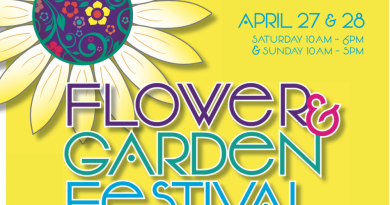 The events are scheduled for Friday, April 26, from 7-10 p.m. at the Leesburg Senior Center and Saturday, April 27 at 3-6 p.m. at the Willard Intermediate School in Aldie. The events are free and open to the public. The Loudoun County Multicultural Advisory Committee provides advice on multicultural issues and strives to create a greater awareness and understanding of cultural diversity in Loudoun County. It identifies issues affecting people from culturally and linguistically diverse backgrounds and recommends strategies to address these issues. Members are appointed by the Loudoun County Administrator.